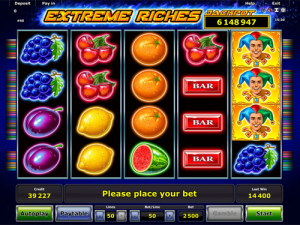 Novomatic’s Extreme Riches is a classic fruity slot game with 50 paylines. The 5 reels are jam-packed full of bright and colourful traditional slot symbols, like fruits, bars, sevens and bells! The Return to Player percentage (RTP) for this game is 94.06% which isn’t great. Novomatic slots tend to have RTPs of at least 95% and some pay even higher percentages. Even other providers make slot games with high RTPs. However, if you’ve played Novomatic games before, you’ll know that even though other providers might make games with higher RTPs, Novomatic games pay out much more. You don’t just have to get the special feature to get big wins in Novomatic slots. They pay out big time, even in the normal mode. Having said that, the features do give great wins. In Extreme Riches, you can win Free Games which come with win multipliers of up to x10! That means, if you trigger the Free Games, all the wins you get during them could be multiplied by up to 10 times! Extreme Riches has Wild symbols and Scatter symbols, as well as a big jackpot. Novomatic make plenty of similar slot games to Extreme Riches! Check them out: Sizzling Hot Deluxe, Ultra Hot Deluxe, Mega Joker, Blazing Riches and Power Stars. You can play all of their games for fun on our site and read reviews on all of them. This will help you choose which ones to play for real money at our recommended Novomatic casinos! As with any slot game, if you match up enough of the same symbol in lucky positions, you can get a big payout! The matching symbols have to fall at least one of the 50 paylines (or however many you have active), which are lines that flow across the reels from left to right. You can see the paths they take by opening up the paytable. Three or more of the same symbol must follow one of the lines, by falling on consecutive reels, starting from the first reel (the leftmost reel). If you don’t get at least three matching symbols, or you get three on a payline but they don’t fall consecutively, then you won’t get a payout. The payouts that you can get (for x3, x4 and x5 matching symbols) can also be seen on the payline. When you increase your bet, the potential wins will increase, too, as will the jackpot! The jackpot amount is always displayed up at the top right-hand corner. Lines can be activated and deactivated and bets per line can be adjusted to suit your budget. Extreme Riches, although quite a new slot from Novomatic, has quite a vintage feel to it. The symbols include: fruits (oranges, lemons, plums, cherries, watermelons and grapes), golden bell, single red bar, double blue bar, triple green bar and red seven. Both the Wild symbol and the Scatter symbols in Extreme Riches pay from three symbols. The Wild symbol is the jolly joker and he pays like any other symbol (x3 or more consecutive matches on a payline). The Scatter symbol is a bunch of golden coins and this symbol pays whenever x3 or more land in any position – it’s a true rebel! The joker Wild can fill in for any other symbol if they need an extra symbol to get a win (so long as the Wild has fallen in the right place). The joker Wild symbols are stacked. The jackpot is paid when you spin all the reels full of joker Wilds (x20 in total)! Three or more Scatters will trigger 10 Free Games. During the Free Games, you will start of with a win multiplier of x2. If you spin another three (or more) Scatters, you’ll get another 10 Free Games, plus the multiplier will increase. This can go all the way up to x10! The best thing about this feature is that the jackpot will also increase by the same multiplier, so if you spin 20x joker Wilds during the Free Games on a x10 multiplier, you’ll get a x10 jackpot!